West Feliciana Parish at the turn of the 19th century was a region in transition. After a slow start in the late eighteenth century, West Feliciana Parish quickly became an important hub of commerce in late colonial Louisiana. Prior to the Civil War, the port of Bayou Sara was second only to New Orleans in the tonnage that passed through its harbor. Its political situation was likewise in flux. 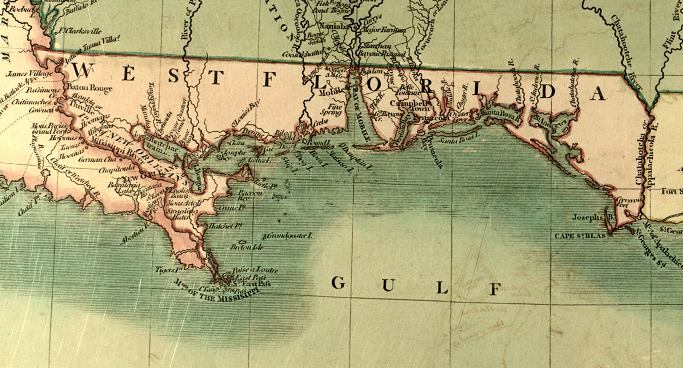 The Felicianas (West would split from East in 1824) were part of a politically contested region of the Gulf Coast called “West Florida” stretching from the Mississippi River to the Perdido River (now the border between Alabama and Florida). The territory of the Felicianas passed through several colonial hands between the 1760s and the 1810s including the French, British, and Spanish empires. 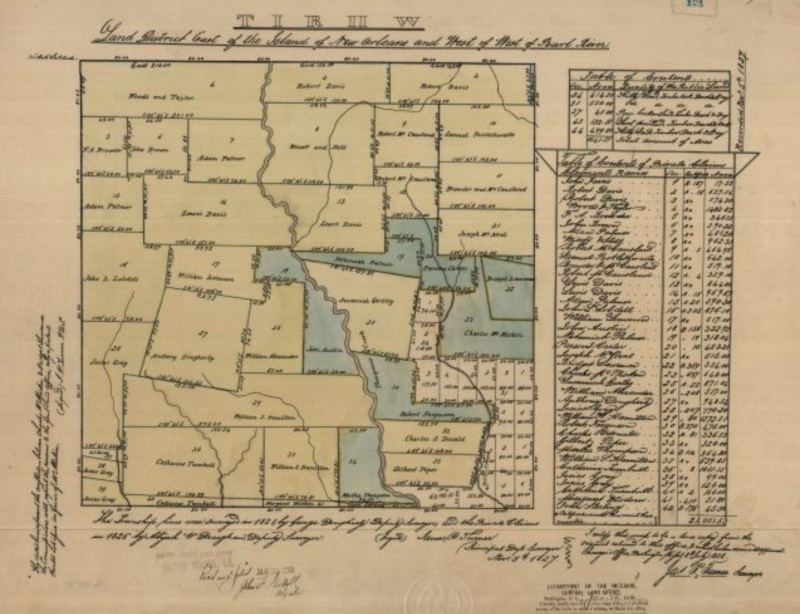 As a part of West Florida, the Felicianas were even a part of the short-lived “Republic of West Florida” before being annexed to the United States in 1810. 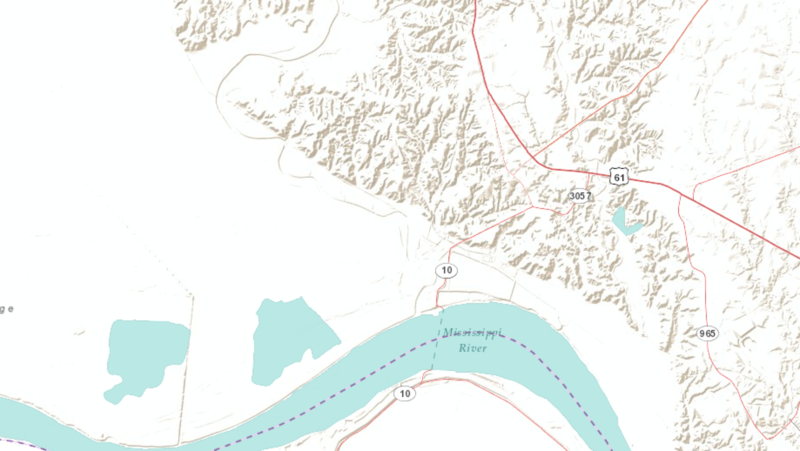 The Bend of the River near Bayou Sara highlights the stark difference between the alluvial floodplains along the Mississippi River and the loess bluffs of West Feliciana Parish. Finally, West Feliciana’s environment is a study in contrasts. Its western border hugs the Mississippi River and a cursory comparison of modern and old plat maps confirms how dynamic and this relationship has been. Alluvial floodplains flank the river and swamps creep into the interior of the parish. Much of the parish sits on a thick loess cap (the parent material for soil) that rises abruptly from the river’s floodplains before slowly tapering off to the east. West Feliciana Parish’s colonial and environmental past warrants investigation and GIS offers a useful tool to manage its complexity. This web mapping product is a prototype for a larger project that will explore the environmental, economic and social development of West Feliciana. “Mapping Rural Development in Early Louisiana” will document the evolution of West Feliciana Parish from colonial times up to the Civil War and highlights changes in settlement, economy and culture in the region. This post documents recent work conducted by myself, Dr. Sara Sundberg of the University of Central Missouri, and the assistance of undergraduate student Miranda Lonsdale at Creighton University. As a first step of this project, we were curious how much early American records could reveal about colonial settlement patterns. When West Feliciana Parish passed into American hands, the new American government was faced with the difficult task of managing their new lands and confirming the rights of prior settlement. Colonial settlers had made claims to West Feliciana lands as early as the 1780s, some under British, some under Spanish governments. The US government endeavored to honor those claims by appointing a land commissioner to confirm the colonial land titles and preserve profitable, legal settlement. Commissioners presented this evidence, including earlier titles and surveys to congress. As a result, historians have a number of different sources available to them to reconstruct early settlement including plats (survey maps), land claims documentation (evidence of settlement and/or purchase), tract books (record book of sold or granted property), and the American state papers (the records of the congressional confirmations). We used three of the four sources for this stage of the project, all of which were available via the LA State Records Office or the Library of Congress. The American State Papers provided information about original claimants as well as the petitioners for US grants. 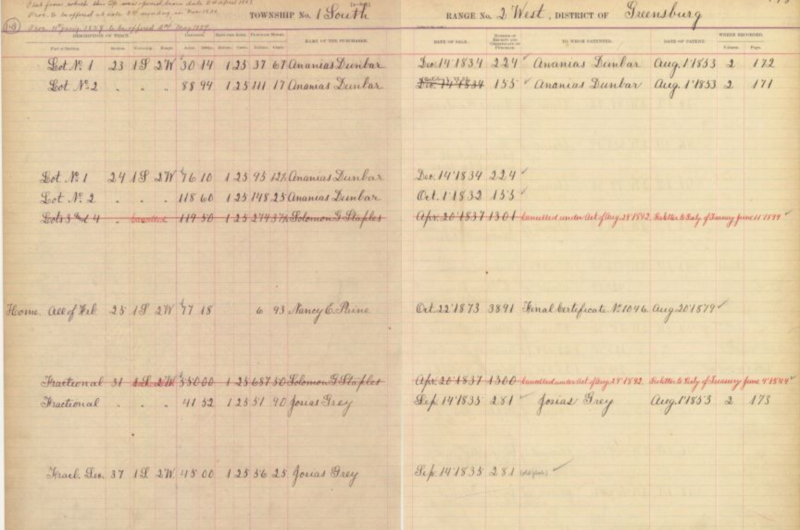 US Tract books housed in the Parish courthouses and available online were handwritten accounts that were directly tied to information gathered in the field and often corresponded with the textual and geographic information offered on plat maps. These plats were organized according to the Township and Range system even though a large portion of West Feliciana Parish was already claimed and would not become public lands. Old Plat Map for District Greensburg T1S R2W. Plat maps typically show economically useful information, such as roads, waterways, and property lines. Older plats typically include notes from the surveyors and the table to the right includes the current resident, section number, and the land parcel area. The principal questions at this stage of the project were largely methodological. To what extent could these sources trace the early settlement history of the region? The results are promising, though not without issues. This first map highlights the date of original colonial claims made in West Feliciana. The earliest was in 1787 during the Spanish period and latest came in 1812 during the American period. This map is interactive. Click on the individual sections to uncover the information available from these sources. The popups include links to the American State Paper images from which much of the information was derived. One thing that is striking about this data is the number that have no original claim information. This is not surprising considering the fragmented nature of the records and because a sizable number of claimants were squatters. (1) This disparity is apparent if you compare a map of preserved Colonial claims to a map of those claims confirmed by congress. Many more records remain that note confirmation than claims. While this is not surprising in itself for the reasons mentioned above, the degree to which you can see this difference is glaring and may prove problematic for a robust analysis in the future. Where does this leave us? 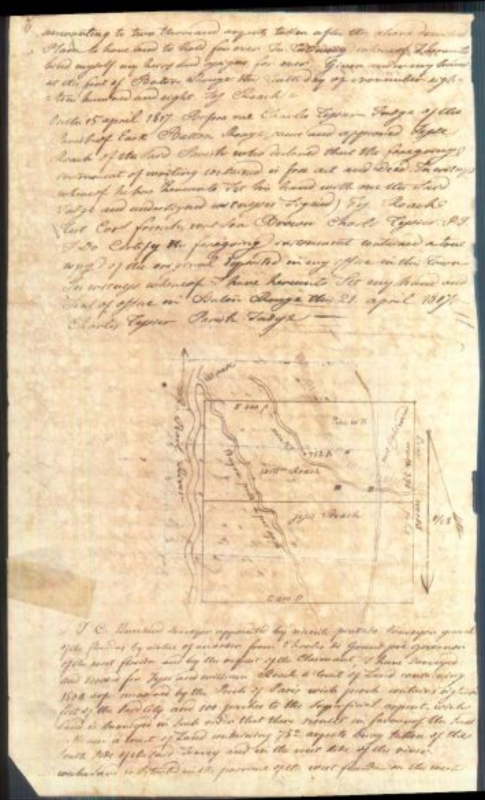 In addition to confirming the absence of claims data in the American State Papers, we can now turn to the actual land claims documentation used by the American government to confirm land titles. These include not only claim information but in some cases the actual British or Spanish land grants themselves. Luckily, many records have been digitized and are available through the Louisiana State Land Records Office. Other are available at the Library of Congress. Still more records may be found in England or Spain, though we have yet to explore this possibility. While not nearly as systematic as the tract books or American state papers, these sources may be the best places to turn to find out the identities of these elusive early pioneers of West Feliciana Parish. 1) Carolyn French, Land Survey and Land Acquisition in the Florida Parishes of Louisiana, Man and Environment in the Lower Mississippi Valley (1978) 111-121). This entry was posted in DH Explorations, Research on July 12, 2016 by ads135.